The 16F30D is fully compliant with ISO15031-3.6. This standard details both the vehicle connector physical dimensions and the requirements of the diagnostics connector. connector using the reaction force of the 16 spring loaded pins without wearing the vehicle latching lug. Also it must be remembered that the standard vehicle fit connector has a limited life cycle and it is of the utmost importance that this life is not significantly degraded before the vehicle even leaves the factory. The centre two pins of the lower row (pins 4 & 5) are raised to ensure grounding contact is made prior to data line contacts. The pins are spring loaded to minimise the wear on the vehicle connector and they are easily replaceable in the event of wear or damage. 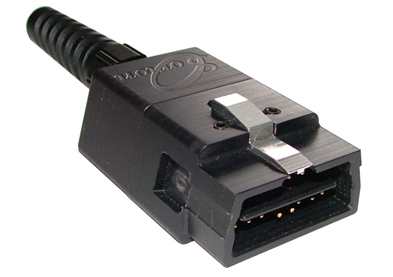 The 16F30D connector is available as either Type A – 12v or Type B – 24v. A M16 spiral gland is provided at the rear of the connector to allow strain relief for the incoming diagnostics cable. Sorion can provide connectors only or made up cable assemblies to your requirements.